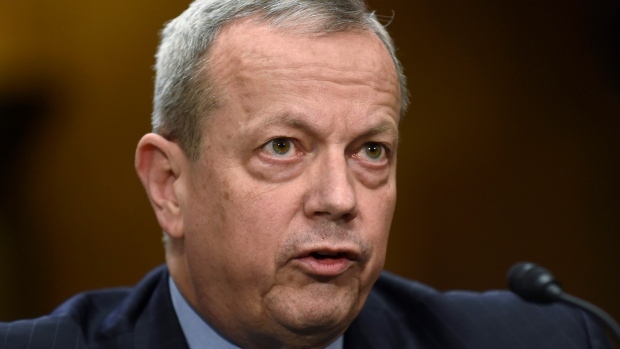 HALIFAX -- If France wants to step up its military campaign against the Islamic State group following the Paris attacks, it should have coalition special forces soldiers attack the group's leadership, a former U.S. special envoy said Saturday. Retired Gen. John Allen, the former envoy to the U.S.-led global coalition to defeat the Islamic State group, spoke at Canada's annual Halifax International Security Forum. French President Francois Hollande has vowed to increase the military response in the wake of the Paris attacks that killed 130. Allen, who left his post just last week, recommended a greater use of coalition special operations forces. "There is substantial capacity in the context of our special operations that can be brought to bear," said Allen, who has been reluctant to publicly discuss advice he's offered to the Obama administration. Allen noted an attack last year in which special forces killed the chief financial officer of the Islamic State, took prisoners and retrieved a large amount of data from computers. He said they attacked other targets within hours of exploiting that information. "You get information that leads to more targets, which generate more operations. That up-tempo of special operations can become so great that you can gum up their capacity to make decisions and create some great demoralization within the system of command," Allen said. He said he would look within the coalition for a combined joint special operations force that could carry out direct attacks against IS leaders. The Pentagon has been pressing European and Arab allies to provide more troops and support for the war against the IS, hoping that the horror of the Paris attacks -- and the fear more are coming -- will compel them to get more deeply involved. The Obama administration announced last month that up to 50 special operations troops will be sent to assist Kurdish and Arab forces in northern Syria. Allen said the coalition has to attack the Islamic State group militarily, financially and online. To ultimately defeat it, the West has to do a better job of contesting the message of hate and recruitment, he said. "Daesh will not be dead as an entity until we've killed it in the information sphere, until we've killed the idea," Allen said, using the Arabic acronym for the group. "We must have a superior message to theirs."